i joined a scattering experiment for . today the Beam-Line-Detector team was finished the BLD, and SHARAQ group is trimming the beam to the SHARAQ detector. i was worked on the neutron detector array, but i was absented for all preparation job due to a polarized proton target. when the neutron hits on the plastics scintillator, it create s proton and further release photons. these photons is result of photoelectric effect and Compton scattering. the photons have different time on reaching the 2 ends of the scintillator due to the position. Thus, by analysis the timing, we can identify the position. The Photo-Multipler Tube convert photon into electric signal. This signal go to a Splitter, the splitter simply copy the signal. one output is go to a Discriminator, which create a digitized signal. 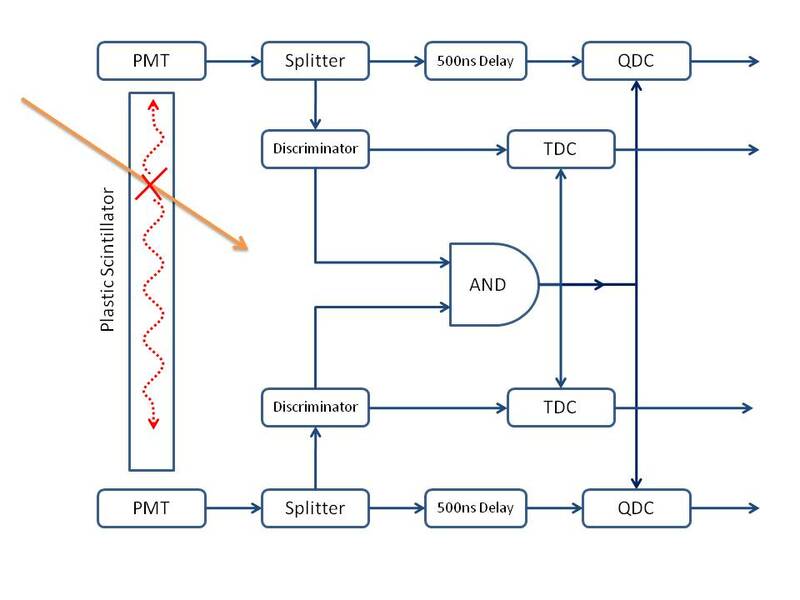 the PMT at the 2 ends will give different timing, and the Discriminator signals will be combined after the AND gate. If the neutron hit the scintrillator near either ends, the AND gate make sure that the later signal will be the trigger signal. where L is the half length from the mid-point of the scintrillator. thus, if we use a geometric mean, we can get the original signal strength. by fitting the statistic, the average of the position should be zero, thus the mean of Δt is the offset by the cable. However, as we mention before, the signal will decay. 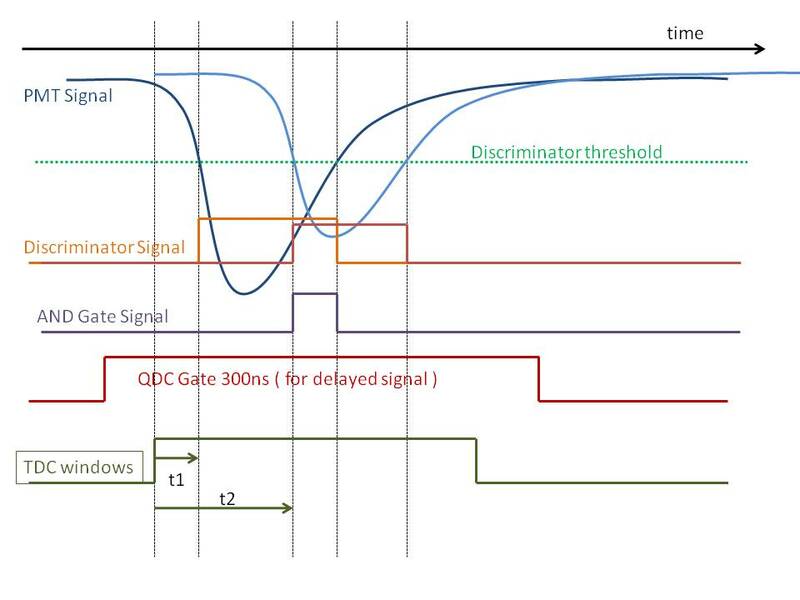 since we are using Threshold Discriminator, different signal strength will give different time even for same start time. This is called Walk effect. For lower signal strength, the effect is stronger. and give larger Walk time. since the Walk time is always additional, the statistics of the QDC-TDC graph will has a tail at one side only. In fact , there is a technique the tackle the Walk effect, which is by a Constant Fraction Discriminator. the principle is that, if we copy the signal and apply a negative fraction on 1 of them and summing up. the point of zero is always the same no matter the amplitude or the signal strength. From the equation, a smaller decay ratio, which corresponding to the location closer to the mid-point of the scintrillator, the bigger the and give a border curve.